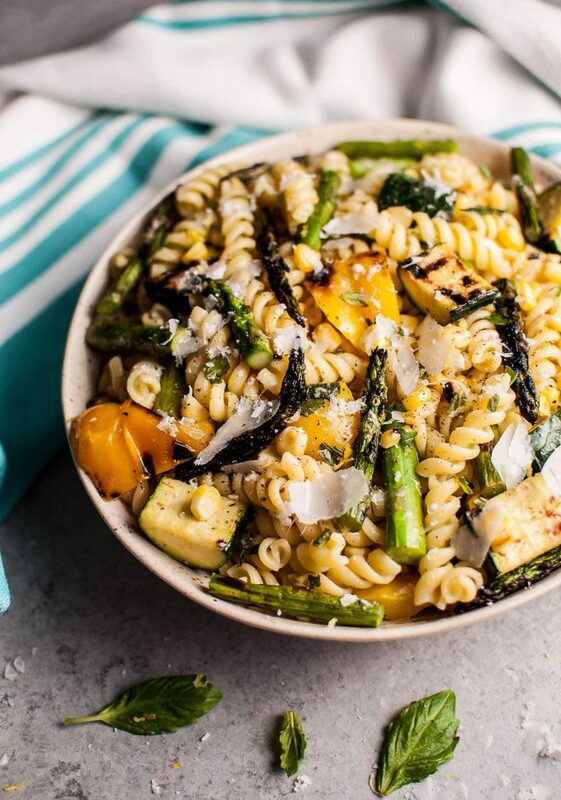 This grilled vegetable pasta salad is healthy and full of flavor! Zucchini, asparagus, corn, and yellow bell peppers are grilled to perfection and tossed with a fresh, lemony dressing. Easy to make and feeds a crowd! I’ve never really been into pasta salads, so I decided to make one that I actually like. 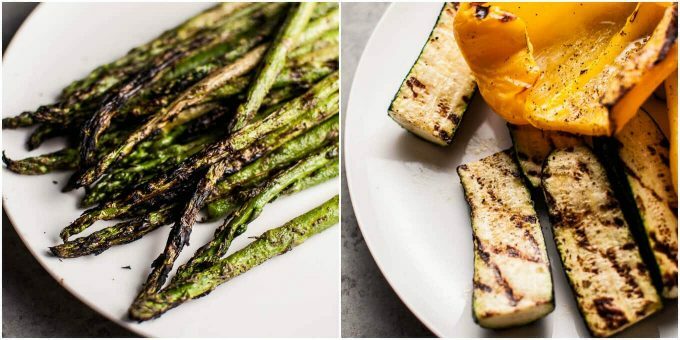 Grilling veggies really amps up their flavor, big time! I wanted this summer pasta salad to taste really fresh, so I added some lemon zest and basil as well. I’ve been using my new lemon zester nonstop (naturally, I’m the type of the person who gets giddy over kitchen gadgets). I’ve had a couple duds, but this one really is the best. I bought it two days ago, and I’ve already used it like four times. It’s still August, but I’ve already been thinking about fall recipes, and I’m starting to panic that it’s going to be winter again soon. I know it won’t be for a while, but still. Yikes. I figured I’d start my winter complaining early get in another grilling recipe or two before the season is over. Here in Alberta we grill year-round (who cares if there’s 10 feet of snow and it’s -40C fun fact: -40C is also -40F), but in the blogging world you’re supposed to follow seasons and stuff. I may just surprise you and throw in the odd grilling recipe out of season, though. Rules? Pffft. I tried to keep this recipe simple so that you wouldn’t have to adjust the temperature of the BBQ for each vegetable because that would just be a pain. So, if you’re looking for a tasty, straightforward recipe to prep ahead and take to a BBQ or potluck, try this! Hope you love this vegetarian pasta salad recipe! 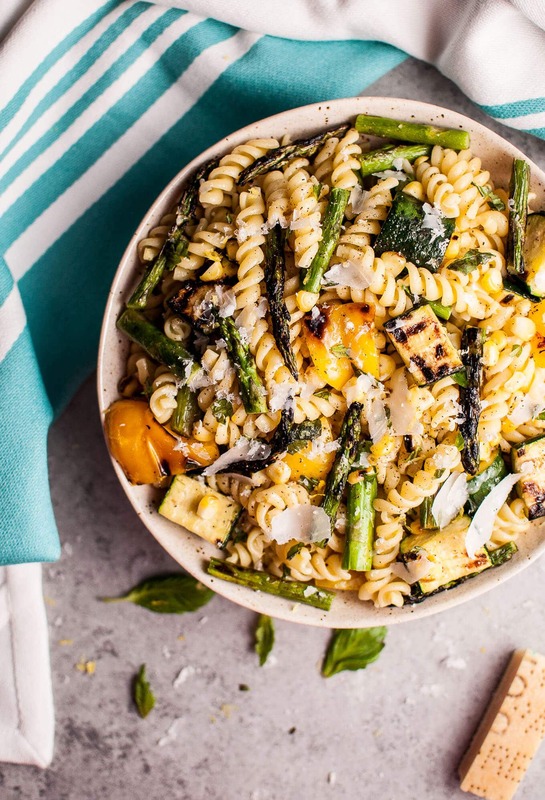 Will you make this grilled vegetable pasta salad? 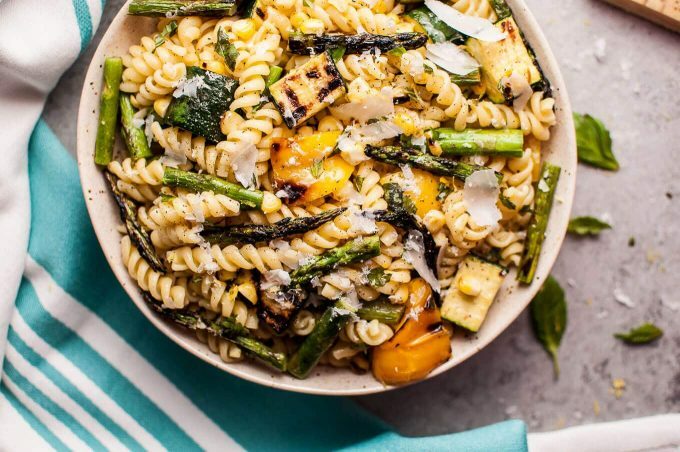 This grilled summer veggie pasta salad is healthy and full of flavor! Zucchini, asparagus, corn, and yellow bell peppers are grilled to perfection and tossed with a fresh, lemony dressing. Easy to make and feeds a crowd! Boil a large, salted pot of water for the pasta. Cook pasta according to package directions. Meanwhile, prepare your veggies. Slice the zucchini in half, and then slice each half lengthwise. Cut the yellow pepper in half and remove the seeds. Husk the corn. Coat the veggies with a light layer of olive oil, and then sprinkle them lightly with garlic powder and salt & pepper. Reduce grill to medium-high heat. Grill the corn for 10-12 minutes total (rotate it a few times) and the zucchini, peppers, and asparagus for three minutes each per side. Once the pasta is cooked, drain it and then rinse it under cool water. Add to a large bowl. Toss it with three tablespoons of olive oil, the lemon juice and zest, and the garlic. Once the veggies have cooled somewhat, use a knife to cut the kernels of corn off the cobs, and then slice the other veggies into bite-size pieces. Add them to the bowl. Tear the basil and add it to the bowl, and shave the parmesan add and it as well. Toss the salad. Can be served right away or refrigerated first. Will keep in the fridge for a few days. I used a gas BBQ to grill these veggies. Keep in mind that every BBQ/grill/grill pan will differ, so use my recipe as a general guide. My vegetables were tender-crisp at the times listed and were cooked at the same time. Grilling them separately works fine too (e.g. if space is an issue). Like vegetarian pasta salads? You may also like my balsamic caprese pasta salad or my spinach, white bean, and orzo salad. summer on a plate! love how you packed the veggies into this salad and used the shaved parm for that nutty, creamy bite.yum! Thanks Cathy!! 🙂 I am not ready to let summer go yet (ok, I never am)! I have the same zester! I seriously use it almost every day, it is the best kitchen tool. And grilling veggies is, in my opinion, the best way to eat them. This pasta salad is basically summer in a bowl. I am dreading winter as well, which is why I am trying to squeeze every drop out of summer! Pinning this! Oh garsh! Maybe it’s because it’s 4:35 and I’m hungry, or maybe it’s because I’ve been sick for 12 days and my body is screaming for nutrients, or maybe it’s everything, but this looks like the most delicious thing on earth right now. Definitely making soon. Mmm! Tasty as written, but even better with grilled purple onions. I guess my bell pepper halves were small (I used half red, half yellow) because it seemed light on the peppers. We added freshly grated parmesan to taste and about half liked it better without. Very easy to customize to your family’s veggie preferences. Love the idea of adding grilled red onion!! I’m glad you liked the dish!